On May 1, 1883, he was married to Miss Mary Bielfeldt, who in every way proved herself an ideal helpmate. Soon after their marriage the young couple took possession of and successfully operated the well-known Bielfeldt hotel. 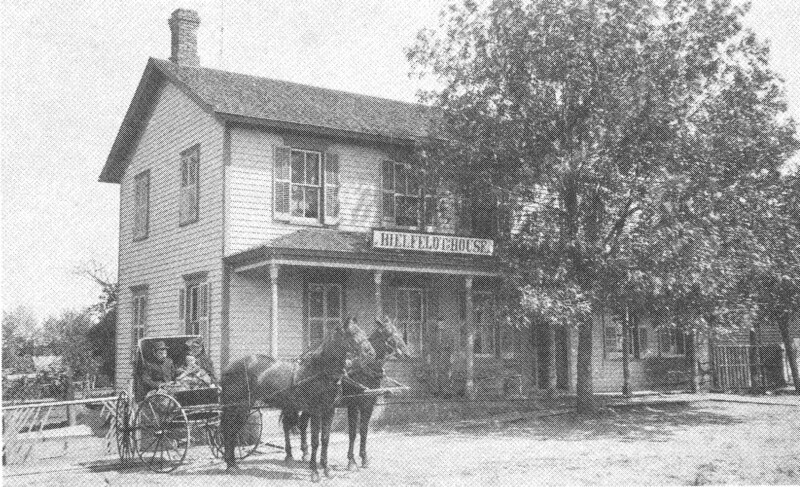 In connection with the Bielfeldt Hotel he was also engaged in farming and in the livery business. 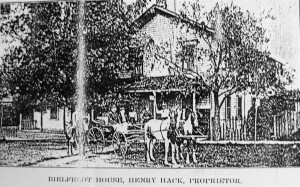 HENRY HACK – Proprietor of the Bielfeldt House Makes Business Hum. “Nothing adds so much to the reputation of a town as a good hotel. The reputation of a town is due in a large measure to the word of the traveling men who visit the town, and who generally voice their sentiments in regard to the house they stop at. 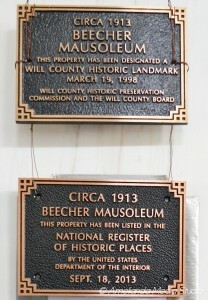 In respect Beecher is much indebted to the Bielfeldt House. The reputation of Beecher as a good town all along the line is due, in a large measure, to the hospitable treatment received at the hands of the host of the Bielfeldt House, Henry Hack. On the first of March this year Mr. Hack celebrated the twentieth year of his connection with the house. He is proprietor also of a large livery with 17 head of horses – the only one in town, and he is also interested in the undertaking business. Henry Hack is essentially a self-made man. He was born in Germany and came to the United States in 1866. At the age of 28 he was united in marriage to Miss Bielfeldt, a daughter of one of the best known families in the township. It was Miss Bielfeldt’s father, Henning Bielfeldt, who was the founder of the Bielfeldt House 34 years ago. Mr. Hack has two sons, chips off the old block, and inherited their father’s character for hard work. Mr. Hack has made some very wise investments in land; and though he is now just 50 years of age he is still a young man to all appearances, both an energy and vigor, and he carries his years like a man of 35. Hard work has not killed Henry Hack. It has made him what he is today. His philosophy has been to look on the bright side of everything. He was always regarded health as the most important blessing and he has lived a clean, healthy life. In his hotel and livery Mr. Hack has one of the best businesses in the village, always conducted and managed on modern, up-to-date principles. In fact, Henry Hack is the embodiment of a useful citizen, and he well deserves the regard and esteem in which he is held by all who know him. He assisted in undertaking with Wollenberger, Fred G Hunte and William F. Hinze. 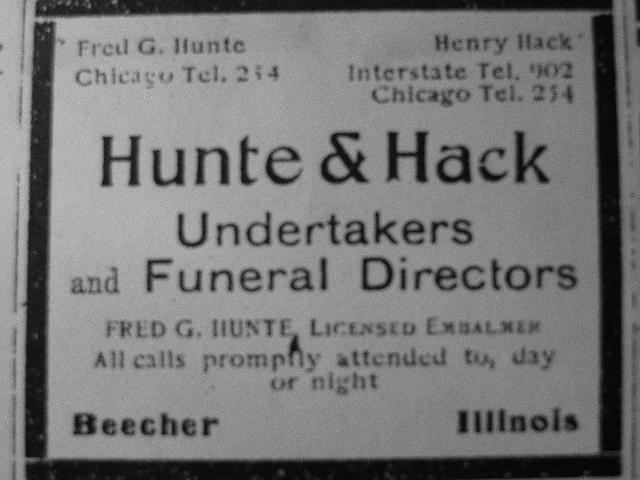 In 1912 he established his own funeral parlor under the name Hack & son. Henry Hack, proprietor of the Bielfeldt Hotel of Beecher and also of a well equipped livery barn, was born at Mecklenburg, Germany, July 29, 1855. His father, John Hack, was a native of Mecklenburg, born in 1825. By trade he was a shoemaker and thinking to enjoy better business advantages in the new world he emigrated to the United States in 1864. Here he gave his attention to agricultural pursuits, locating on a farm of eighty acres in Washington Township, Will County, Illinois. 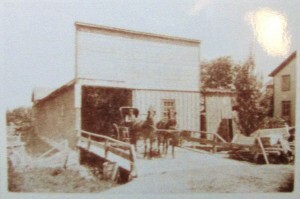 For about twelve years he followed farming and in 1876 removed to the village of Beecher, where he engaged in general merchandising in partnership with William Peck. Three years later he sold out and two and a half years conducted a store at Eagle Lake, where he was postmaster for two years. 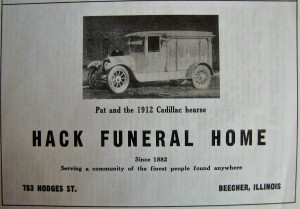 He then returned to Beecher and again engaged in general merchandising, also conducting a market until a few years prior to his death, when he retired. His last days were spent in the enjoyment of a rest which he had truly earned and richly merited. He sustained injuries in a runaway accident in 1879, from which he was a sufferer for many years, but the immediate cause of his death was paralysis and he passed away in Beecher, February 1, 1898. His wife, who bore the maiden name of Sophia Luth, was also born in Mecklenburg, Germany, and is still living in Beecher at the age of seventy-eight years. She holds membership in the German Evangelical Church, to which Mr. Hack also belonged. When they came to the United States they were in very limited financial circumstances and knew well what hard times were. They lived on the prairie in a little board shanty, the wind blowing a gale across the country with nothing to break its force and often sifting the snow through the cracks of the pioneer home. As the years passed, however, all this changed owing to the industry and enterprise of the father and the able assistance which he received from his wife and children. The family numbered eight children, of whom three died in infancy, while five are yet living: Herman, who resides upon the old homestead in Washington Township; Henry: Charles J., who is living retired in Beecher; Frank, who succeeded his father in business and is now conducting a general store; and Emma, the wife of Sherman Loitz of Peotone. Henry Hack was a youth of nine years when the family came to the United States. He was reared to farm life, being connected with the work of field and meadow until 1885, when he engaged in the hotel and livery business. He has since given his time and energies to these lines with the exception of an interval of sixteen months. He owns forty acres of land adjoining the village, which he farms. He also owns a hotel property, livery barn and a residence in the village, together with residence property in Chicago. The Bielfeldt Hotel is the best in Beecher and Mrs. Hack personally superintends the kitchen, being an excellent cook. Everything possible is done for the comfort and convenience of their guests and the hotel is well patronized. Mr. Hack is also a partner in the undertaking business conducted under the firm name of Fred Hunte & Company. On the first of May, 1883, occurred the marriage of Mr. Hack and Miss Mary Bielfeldt, who was born in Schleswig-Holstein and is the daughter of Henning Bielfeldt, whose birth also occurred in the same place, August 12, 1817. In 1866 he emigrated to America and for a year he followed the trade of wagonmaking at Thornton, Illinois. He then engaged in farming in Washington Township. When the Chicago & Eastern Illinois Railroad was built in 1870 and the village of Beecher sprang up his farm lay partly within the corporation limits. He built one of the first houses in the village and conducted the hotel for many years. He was one of Beecher’s most prominent business men and engaged in various enterprises which constituted an important element in the development and growth of the little village. He died in 1890, while his wife, who bore the maiden name of Catherine Dethlefs and was born in Germany. September 21, 1821, survived until the 30th of May, 1906. They were the parents of six children: Annie, the wife of Fred Bielfeldt, a resident of South Dakota; Mrs. Hack; Minnie, the wife of M.J. Tillotson, a merchant of Crete; Simon, who died about ten years ago; Henry, who died two years ago; and one who died in infancy. Mr. and Mrs. Hack have two children, Edmund and Albert, both at home. In Politics Mr. Hack has always been earnest and unfaltering republican and was a trustee of the village when it was incorporated. He served in the capacity for seven consecutive years and later was again elected and acted as trustee for six years. He was also deputy sheriff of the county for eight years and is now filling the office of constable. He and his wife attend the Congregational Church. He is one of the representative business men of Beecher, prominently connected with various business and public interests, and his labors have been a direct and beneficial influence in promoting the growth and development of the town. 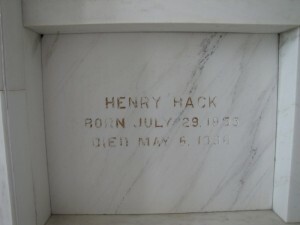 Henry Hack – numbered among the solid and responsible businessmen of Will County, Henry Hack has long been connected with the business life of Beecher. He was born in Germany, July 29, 1855, the son of John and Sophia (Luth) Hack. John Hack, deceased, was a pioneer settler of Will County. He came to this country early in life and purchased a farm of 160 acres in Will County. Later, he became interested in the meat business at Beecher and also conducted a general mercantile business. He was well known as a dependable merchant in this community. He died in 1908 at the age of 71 years. His wife died in 1918. Both are buried at Beecher. The business, established by Mr. Hack, is now carried on successfully by his grandson, Arthur Hack, and is one of the oldest business houses in the county. To Mr. and Mrs. Hack were born the following children; Herman, died in 1926; Henry, the subject of this sketch; Carl, retired, lives at Hammond, Ind. ; Frank, deceased; and Emma, married to Sherman Loitz, lives at Peotone, Ill. The boyhood of Henry Hack was spent in Washington Township and he attended the district schools. He was associated with his father’s business at Beecher until about 1885, at which time he established his present undertaking business at Beecher. He also opened his hotel at that time and to the present time has ranked among the reliable hotel owners of Will County. A livery business, organized by Mr. Hack, was discontinued about 1910. In its place the garage of Hack & Son was organized and they are local dealers of Chevrolet automobiles. A first class repair shop is conducted in connection with the sales service and a complete line of automobile accessories is handled by the firm. On May 1, 1883, Mr. Hack was united in marriage with Miss Mary Bielfeldt, of Beecher, the daughter of Henning and Catherine (Dethlefs) Bielfeldt, both deceased. To them were born two children; Edmund C., born Jan. 13, 1888, a graduate of Chicago Heights High School and Loyola Medical College, Chicago, now a physician and surgeon at Hammond, Ind. married on Nov. 21, 1912, to Miss Margaret Schwarz, of Chicago, and they have three sons, Theodore, Robert, and LeRoy; and Albert B. born April 24, 1892, a graduate of Beecher High School, now associated with his father’s business interest at Beecher, married on Dec. 29, 1912, to Miss Marie Deneke, of Beecher, and they have a daughter, Betty Jean, born Oct. 2, 1928. Mr. Hack has always been a republican. He is a member of the Evangelical Church of Beecher, and is affiliated with A.F. and A.M. No. 1087, Beecher and Modern Woodmen of America. He has served as village trustee and has been constable of Beecher for a period of 30 years, as well as deputy sheriff of Will County. Mary (Bielfeldt) Hack died Nov. 10, 1924, at the age of 69 years and is buried in the Beecher Mausoleum. Henry Hack & Son have purchased the old Thielman home. This residence was built by H.F. Thielman some years ago as one of the largest, most pretentious homes in this section. It has remained vacant for a number of years due to its enormous size and the changed living conditions which has made it unmarketable for purely residential purposes. It is the intention of the purchasers to convert the first floor of the residence into a modern funeral home while using the second floor for living purposes. 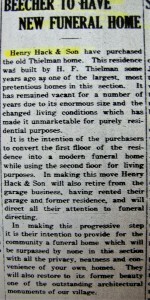 In making this move Henry Hack & Son will also retire from the garage business, having rented their garage and former residence, and will direct all their attention to funeral directing. The departed, Henry Hack, son of John and Sophia Hack, both long deceased, was born July 19, 1855, at Hohenphiegel, Mecklenburg, Germany. The child of Christian parents he was, soon after birth, baptized in the name of the Tribune God. At the age of nine, he came to this country with his parents, who settled on a farm east of Beecher. Given the opportunity and privilege of Christian education, he was, March 21, 1869, confirmed in St. John’s Church, east of Beecher, by Rev. Reineke. Four years later a tenacious infection of his right leg practically made him an invalid for 8 years. Recovering from his ailment he, for 3 years, helped his father in the grocery business, both at Eagle Lake and in Beecher. On May 1, 1883, he was married to Miss Mary Bielfeldt, who in every way proved herself and ideal helpmate. The union of this happily married couple was blessed with 2 sons, Edmund and Albert. Soon after their marriage the young couple took possession of and successfully operated the well-known Bielfeldt Hotel. In connection with it the departed also engaged in farming and in the livery business. Three years later, in fact throughout a period of 48 years, he assisted in undertaking with Wollenberger, Fred Hunte and Wm. 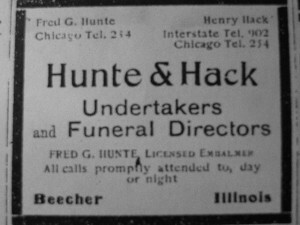 F. Hinze, until in 1912 he established his own funeral parlor under the name of Hack & Son. Since the death of his beloved wife, November 10, 1921, he carried on his usual work. However, finding the hotel business no longer profitable he, in 1932, closed the doors of the hotel, which during its long time operation was known far and wide as one of the most home-like hotels in the state. Making his home with his son Albert, he found it necessary, about a year ago, to retire from active work because of ill health. Failing rapidly because of an incurable disease his indomitable will-power helped him be up and around until three months ago, when he became bed-fast. During this time he was given the best of medical skill at the hands of his son, Dr. Edmund Hack, and Drs. Hiatte & Kupke. As also the finest loving attention and care of his son Albert and wife. This utter devotion on the part of his children with whom he found such a pleasant home touched him and all visitors deeply. But in spite of all that was done so lovingly and faithfully, he had to answer the final summons, which came to him in peaceful death, Wednesday, May 6, at 12:30pm. at the age of 80 years, 10 months and 7 days. 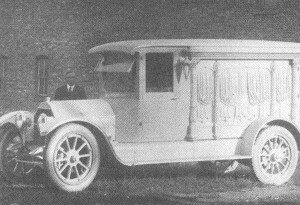 Those mourning his departure are his two sons, Edmund, Hammond, and Albert, Beecher; 2 daughters-in-law; 4 grandchildren, Theodore, Robert, LeRoy and Betty Jean; one sister, Emma, Mrs. Sherman Loitz, Peotone; 2 brothers-in-law; 4 sisters-in-law, and a large host of other relatives and friends. Funeral services were conducted, Saturday, May 9, beginning at 1:30 at the house and continued at 1:40 at St. Lucas Church where his pastor, Rev. G. Horst spoke in both the German and English languages to a large gathering of relatives and friends, who had come to pay their last respects to one who truly merited it. The many large, beautiful floral pieces also amply attested to the high esteem in which he was held by all. He found his last resting place in the mausoleum. In the passing of Mr. Hack, so well known, highly esteemed, respected, honored, because of his integrity, honesty and fair-mindedness, all of Beecher and neighborhood has suffered a severe loss. Because of these sterling qualities he was often privileged and honored to serve his community as school director, alderman and sheriff. As a member of St. Lucas Church he proved himself a willing contributor to the up-building of his church and Larger Kingdom. As a husband and father he endeared himself deeply and lastingly in the hearts of those always so near and dear to him. Thus, true to his Christian training, drawing especially near to God during his illness, we may well hope and trust that his passing out of this life was but the entering into eternal life. This entry was posted in Automated Burial Listing, Beecher Lodge 1087 AM & FM, Burial Listing, Burial Location, HEADSTONE, Moderan Woodmen of America, Obituaries- Have Full Copy, St. John Evangelical Lutheran Church - Eagle Lake, St. Luke's UCC - Beecher, Village of Beecher board member by Sandra. Bookmark the permalink.